For the treatment of obstructive sleep apnea, the SomnoDent appliance is worn during sleep to maintain the patency of the upper airway by increasing it's dimensions and reducing collapsibility. 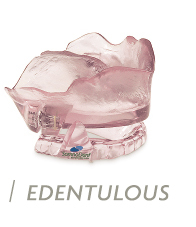 SomnoDent is a custom made appliance, comprised of upper and lower dental plates with a unique patented fin coupling component, which allows normal mouth opening and closing. If you have questions or concerns about sleep apnea appliances, please ask Dr. Weinhold. Made from the highest quality orthodontic acrylic, the Classic has been designed to offer durability comfort and quality. 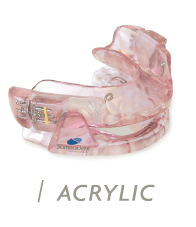 Designed for patients with no upper teeth and made from either Flex or Acrylic. A quantum improvement improvement on existing edentulous devices.